Thanks for adding me but I definitely cant make Thursday (Midday for me here, will be working) and Friday I wont be able to join till late (11.30 gmt earliest) so you might aswell give me spot to somebody and hopefully I can join in when I get home from work. Ill be on Tues 30th 5.00am GMT / (6.00pm tomorrow in NZ) if it works with anyone else keen for a trek/truck around with a friendly person. Find all the event news, photos and off-road blog for sneak peeks at what is coming next. To join the invite list for future events fill in the contact form and rate us ! To help improve future meets. My son and I drove around some of the map, from the Military Base, clockwise to basically where the coast finishes and turns into the Port. Took a long, long but was a challenge. I had to call for my 2nd SandKing when the first was stuck between rocks and was impossible to move. Good fun although my son insisted on doing each Gang attack we stumbled on. I need to sell a Sandking, three is too many! My internet is still not fixed and I'm using my neighbours wireless broadband at the moment so I will gladly give my place to my friend and fellow crew member FailingGeorgew if thats ok with steve dogg 51. I don't want to be lagging and jumping around on everyone's screens. I've even bought a shirt and tie for my character for tonights get together. I sold one of my Sandking XLs to make space for a new Sadler pick-up but for tomorrow night i'll be in my other Sandking XL with a Sandking SWB, Mesa and Rebel on standby should I wreck it! invites going out in about 20 -30 mins, due to update ! I should be on xbox in 20 mins. Can only stay for an hour though. I'm in if there still space on the list!! 1 - want to hear a guy from Wales so loud through your headset that your ears bleed and use a whole roll of toilet paper to stop the blood loss. 2 - if you want a good time offroading. Many would say Steve is making routes as he goes because it's offroad, there's space for improvisation. Maybe he does but he brings us to cool spots and there's always a bunch of challenging hills that even Sandkings have trouble completing. Even when we wait around it's always a fun time as Steve is a very laidback host and he's never mad. We've had a problematic player that got a few kills and all Steve said was, "right, guys, if you can kick this guy so we can continue the meet I'd appreciate it". He's pretty much saying, "this dangerous man is killing everyone and will probably piss on your corpses but if you could kindly, and if possible, kick him I'd like that but if not then it's okay. Right, who wants to get some ice cream?" I love that about him! He's such a cool dude and people immediately know what type of meet they're in and can't help but be cool as well. Congrats on another successful meet, Greg Steve! Before going further, weeks ago I replaced De (if I remember correctly) in a meet and I warned three players for not following directions and one of those three even killed a player twice. We had some "heated" messages on why you shouldn't kill other players at meets and I met him again at this meet. I thought he would hate me for having a different point of view, which I totally respect and understand, but he didn't bring it up at all at the meet...or he didn't recognize me. Now I know how being a car meet host is hard and having a good reputation is important so I want to give a shout-out to him here for being such a cool guy. I'll be honest, I was a bit judgmental about him seeing I never spoke to him (he didn't have a mic at the replacement meet) but he's a really awesome dude and I'm sure he's great host material, no doubt. Thanks for the good time, Mr B Dubss. Not following directions is a pretty tame thing at meets as I see a lot of players that join meets just to f*ck around. Granted, killing a player for not listening isn't my preferred way of dealing with those that ignore directions but to attack back with rocket launchers and kill innocent players is not accepted. As said; killing a player because they're not listening should not be done but once you shoot back it is seen as self-defense on our part if we fire back. Seeing we're the majority, you know, those that want to have a car meet which was the whole f*cking point of the lobby, please understand that we were only wanting to have a relax evening and the rockets didn't help. I am simply warning you personally. I do not represent Steve's meet in any way but I know that he'd want to have players that don't blow up the personal vehicle of others simply because you got killed by a trigger-happy player (who should be warned as well seeing he was told he shouldn't fire) and then retaliated like a twelve year old that throws a tantrum whenever a fly enters his room. Not a warning but a little tap on the wrist to Gotacos for not following directions (not having an offroad vehicle - riding a street motorcycle and hitting the trucks isn't pleasant) and for blowing up vehicles at the end (blew up Lawd Nakaba and his vehicle - not having a mic or text the host to reassure that it was an accident can make us on edge). Just be careful in future meets. Favorite part of the meet? Destruction derby with a fire truck at the ready to put out engines on fire and make the destruction last longer! Had a great time there. Let's show them what we were hitchin'! "Sir, I say I can best you in air-piano playing!" "My rebuttale shall be hasty for your wife awaits my presence under her bed covers!" Really?! I swear if the next picture isn't something other than a Sandking I will blow my brains out! At this point I had my water gun to my head but I didn't squirt my face in this white water for this truck belonged to a very rare type of gamer - a girl. Yes, finally a female character was played by an actual female! In all seriousness; there was...two female players? Not sure, to be honest, but they were really cool and were so competitive that I felt beaten by her/them. Wish to see you again! I'm getting lazy with the tradition of selfie-first pictures. Late in the start of the meet...here it is! Now you can go cry and ask yourself, "why?!" Aaaand we're here! Our first challenge - who wants to go first? "Sandkings are overrated, I can climb this no problem!" "Anyone has a bottle of water?" This just in: Sandkings actually learned a new trick. Nice first challenge but we were ready to move out. Check the post below for voting and more chaos! With so many Sandkings, voting was broken down a bit. First up was "Best of first row" who went to xRax Cynister with his Bodhi. Congrats! Next up was "Best Sandking", who Mr B Dubss won with his lime green king. Congrats! While it was "Best overall", this could be counted as "Best of Show" which steve himself won. Congrats! "Ah, hell yeah, playa! Raise da roof!" "Here are all the f*cks that I give, have them!" The line-up a good 2 hours in? We stopped and that gave me an opportunity to promote how superior the light version of the Rancher XL is. Look how sleeker and lighter it is! Don't waste time rolling the window down! Let your whole body feel the harsh wind when you're driving at 100 miles an hour. Love nature? You'll feel every insect splatter their love on your face with the option of having no windshield! Get the new light Rancher XL for only $24,999 more than the price of the base model. Get it now! Yes, I was driving for a good 10 minutes with the truck in front of me having a plate that says AZZFKR which can translate to someone who doesn't enter a house by the front door, knaw what I'm saying, brah? Sadly, I have no pictures of the epic destruction derby. Here's the winner who rammed everyone the whole time yet was the last to survive. Congrats, you! Thanks for a good meet to all who joined, the off-roading was a little tame compared to usual but was a good warm up for the full around los santos challenge tomorrow. The concept was to have more of a meet theme than our usual off-roading, let me know if you though it worked or not. or if you prefer the usual format. 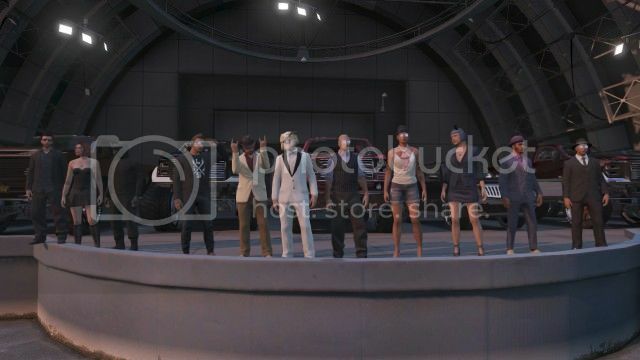 photos to be posted here soon or if you cant wait check out the website http://aroundlossantos.weebly.com/ feel free to leave comments on pics and comment on the blog.